Exoplanet Puzzle: How Is This Giant Alien Planet Too Big for Its Star? 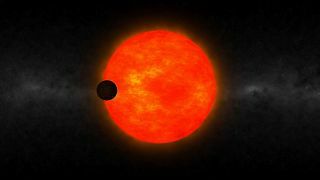 An artist's impression of the red dwarf star HATS-6 and its "hot Jupiter" alien planet. A giant alien planet is seemingly too big for its cool dwarf star, raising questions about how it could possibly have formed, a new study reports. Further investigation of this odd exoplanet and others like it could help scientists understand the extremes of where and how planets can form, study team members said. The newfound exoplanet orbits a star known as HATS-6 that is located 500 light-years away from Earth. HATS-6 is a red dwarf, a small, cold star only about 60 percent as wide and massive as the sun and just 5 percent as bright. Red dwarfs, also known as M stars, comprise about 70 percent of the stars in the Milky Way galaxy. Dips in HATS-6's brightness detected by small robotic telescopes suggested the star had a planet that regularly passed in front of it. The Magellan Telescope in Chile, one of the world's largest telescopes, along with amateur astronomer T.G. Tan, who operates from his backyard in Perth, Australia, helped confirm the existence of the exoplanet, which was dubbed HATS-6b. The Magellan Telescope and Australian National University's 2.3-meter telescope revealed that HATS-6b has an orbit just 10 percent as wide as that of Mercury, completing an orbit around its star every 3.3 days. HATS-6 is one of the smallest stars to host a hot Jupiter, and only two known exoplanets orbit closer to their stars than HATS-6b, researchers said. HATS-6b is about 100 times more massive than Earth. This makes the exoplanet about as massive as Saturn, and about one-third as hefty as Jupiter. "HATS-6b is a relatively big planet that orbits a very small star," study co-author George Zhou, an astronomer at Australian National University in Canberra, told Space.com. However, HATS-6b is about as wide as Jupiter, "so it's quite a puffed-up planet," Zhou said in a statement. The hot Jupiter's star heats the planet up to about 820 degrees Fahrenheit (440 degrees Celsius), explaining its puffiness. Planets emerge from the leftovers of star formation. "Small stars have less material around them, making it difficult to form large planets, so it is rare to see a large planet as big as HATS-6b around a small star like HATS-6," Zhou told Space.com. Scientists do not think hot Jupiters such as HATS-6b form where they now orbit; at such close range, the radiation and winds from their host stars would blow away most nearby matter, leaving too little to form such large planets. Instead, researchers think giant planets are born far away from their stars and then migrate inward because of physical interactions with the ring of gas and dust that initially surrounds young stars, or as a result of gravitational interactions with nearby planets. Until now, very few giant planets have been discovered around small stars, so it remains uncertain what their inward migrations were like. "Is migration within the disk very efficient, given the smaller mass of the disk?" Zhou said. "Are there enough materials to form many other large planets, required to scatter HATS-6b inward to its current location?" To answer these questions, the Hungarian-made Automated Telescope Network-South (HATSouth) Exoplanet Survey is analyzing data from six telescope systems to discover more planets like HATS-6b. Analyzing the shapes and directions of the orbits of such planets "may tell us how these planets migrated inward," Zhou said. The scientists detailed their findings in the May issue of the Astronomical Journal.